When Jay Anson’s account of the Lutz family’s terrifying 28 days in their home in Long Island was released in 1977, it didn’t take long for two things to happen: one, that it would cause mass criticism of the legitimacy of the claims and two, that it would spawn a movie only two years later. 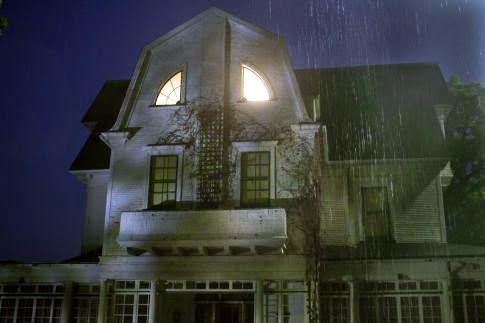 The Amityville Horror has become the Holy Grail for many who love chasing ghosts and for producers raking in money from sequels. In fact, 2015 welcomes yet another remake. What is so enticing about a haunted house? So much, it appears that writers have been retelling the story for ages. On August 26, 2014, Micol Ostow releases his version of the one of the most famous horror stories ever told. Ostow’s Amity is told through split narration, in the present from Gwen and ten years earlier through Connor. Both families only managed to live in Amity (the name of the house) for twenty-eight days (the first similarity to the original account). Both Connor and Gwen are sensitive to the supernatural within the house and are considered a risk by their parents and their doctors. Connor is very close to his twin sister Julianne, aka Jules, aka Annie, much more than the average twin as he must protect her from their abusive father. Only days after moving to Concord, Connor begins to have frightening dreams, to a point where it becomes difficult to separate dream from reality. Gwen, whose brother Luke appears to unraveling before him, has to maintain her own sanity to control the situation. Both, separated by ten years, fight the same fight against the house, and Amity seems to have more in store for them than they ever imagined. The dual narration is very confusing at first, and it takes about a quarter into the novel to discern the two stories. Actually, halfway through the novel is the point of greatest interest as “actual” psychological documents show the mental histories of both Connor and Gwen. While the two stories are interesting, and it is unique to read about the same occurrences from two different sources (although incredibly unreliable), there seems to be too much of a disconnect between the accounts. This could have easily been a collection of accounts from several perspectives. The anticipation of gore, Amityville-style, never happens, and the references to 3:14/3:15 am and the ominous boathouse are already too overdone to be scary. I expected more horror, more descriptive images of the house itself. Of course, in this day and age, it is difficult to recreate and supersede the original fear that the house with eyes caused back in the 70s. For a girlvwho grew up on Stephen King’s It and the R.L. Stine Fear Street series, this just misses the boat.